Eastern Washington ranchers don’t like wolves. 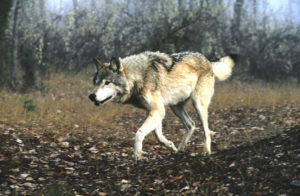 Worried a wolf researcher’s work might harm legislative support for its planned medical school, WSU paid the researcher $300,000 to take a hike. Emails revealed some state senators linked WSU’s medical school funding to silencing the researcher. In short, scientific research and academic freedom are subordinate to political expediency in Pullman and Olympia. Read story here. Photo: This is only a wolf. If you want to see predators, go to Pullman and Olympia. ← Whatever Happened to Freedom from Religion?